It has an unassuming build; it does what it is supposed to do surprising well; it has an attractive price tag; it is one of the most popular and bestselling handheld vacuum cleaners on the store shelves; it is the Eureka EasyClean 71B Corded Handheld Vacuum Cleaner. Aside its inspiring meaning, the Eureka brand is popular for its no-gimmicks, get-the-job-done line of products. With the EasyClean 71B, it has a winner that sports outstanding suction power, terrific cleaning prowess within a simple, yet elegant build designed to be durable even though it carries a very affordable price tag. Its ability to speedily yet comprehensively clean is a major reason why it adopts the more catchy moniker—The Quick Up. Why You Should Buy the Eureka EasyClean 71B? The biggest draw of the EasyClean 71B and arguably one of the top reasons why it is a shopper’s favorite is that it does what the buyer expects it to do exceptionally well. This is a relief going by how often products under-deliver after the marketing hype of being the best thing since sliced bread. To put it simply, you wouldn’t be disappointed with your purchase, and would actually be pleasantly surprised of how well it performs despite the budget-friendly price point and the compact build. Much of the 71B exceptional performance owes to its dual-motor configuration. That is, it has one motor specifically for its suction functionality, and another specifically for its revolving brush. Together, they accord the Eureka EasyClean 71B car vacuum a satisfying suction power for proficient cleaning. In addition to its impressive suction power, the device also sports an extended cleaning path width of 6 inches, which offers comprehensive cleaning capabilities. Little wonder why the device enjoys rave reviews and can take up common types of dirt and debris including pet hair without hassles. Eureka went full throttle on the EasyClean 71B as it sports an innovative technology called the Riser Visor. This is an enthralling technology with very practical usage. The Riser Visor is a clear plastic rotating cover that stays over the brush roll. How it functions is that, with the plastic cover in the default position, the brush roll cleans horizontal surfaces as the brush roll action is toward the bottom of the nozzle to clean flat surfaces. However, flipping up the plastic cover exposes the front of the revolving brush roll. Accordingly, the brush roll action then acts on vertical surfaces. It isn’t entirely complex, but it is nonetheless an indispensable addition—certainly not a gimmick. The brush roll is at the heart of the cleaning prowess of the Eureka EasyClean 71B Corded Handheld Vacuum Cleaner. Interestingly, Eureka offers you the ability to toggle it on or off. On the surface, it may not seem like much: However, in real-time, the switch can be the difference between a seamless cleaning experience and quarter of an hour of cussing. Okay, maybe the last part is a little exaggerated. Regardless, there are times when turning off the brush roll is a good idea. For example, when picking up dust from certain types of surfaces, and picking up pet hairs that occasionally stick to the rotating brush and prove difficult to remove. The most appropriate words to describe the 20 feet power cord of the Eureka EasyClean 71B are “absolutely breathtaking.” The enormous leash guarantees that no spot in your car interior will be out of reach for thorough cleaning. Furthermore, when you are done cleaning, you needn’t worry about how to arrange the cord neatly for storage. The build of the device features a specially designed base around which you can wrap the cord and keep it in place with a built-in clip. For extensive cleaning, the EasyClean 71B features several attachments that extend its functionality. These include the crevice tool, for cleaning areas that are difficult to access; and a stretch hose. 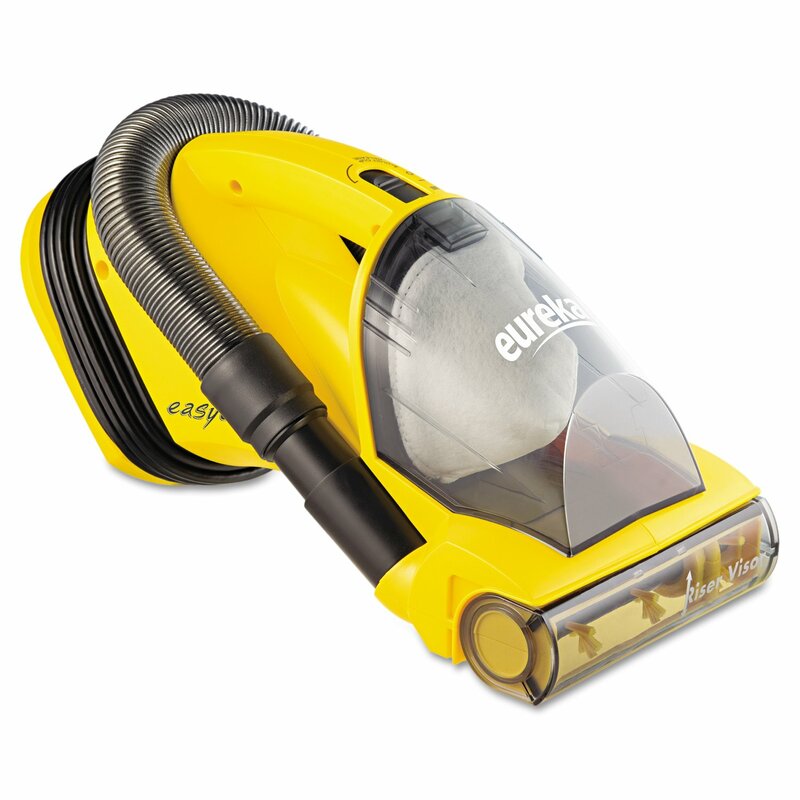 Using the Eureka EasyClean 71B Corded Handheld Vacuum Cleaner is a pleasure. Starting off, it features a natty auto-shutoff feature that automatically stops the device from functioning when the device is in danger of overheating. Going forward, maintaining the EasyClean 71B car vacuum is as easy as pie. The dirt bin is detachable, so you can empty its contents easily and even wash it with water before reinserting it to the device. You can also remove the filter seamlessly and clean it without much ado as well. One very important feature that makes the 71B handheld vacuum so easy to maintain is its power switch that also doubles in function to unlock the filter and dirt container easily. When used primarily for your car vacuuming needs, the Eureka EasyClean 71B Corded Handheld Vacuum Cleaner is one very durable machine. It goes strong for years, thanks to its awesome build and easy to maintain status. Affordable – The Eureka EasyClean 71B Corded Handheld Vacuum Cleaner will not cost a strain on your pocket. Extensive Power Cord – The car vacuum features a 20 feet power cord that offers lots of room to clean even the most treacherous locations in the interior of your car. Automatic Shutoff – Exceptional safety feature that stops the device from functioning when there is danger of overheating that could lead to irreparable damage of the vacuum’s internals. Durable – Despite its low price, the EasyClean 71B can function efficiently for years. The tripartite reasons for its durable nature are its sturdy build, safety features, and it being easy to maintain. Three core reasons, amongst a multitude of benefits make the Eureka EasyClean 71B Corded Handheld Vacuum Cleaner a must buy. They are high-end performance, durability, and affordability. Rarely do these three qualities describe one device, which makes the EasyClean 71B car vacuum ideal for usage in maintaining a pristine car interior.